Loop, whirl, circle, and land — deftly maneuver the Dip-er-do II Booerang Stunt Plane for amazing flight performance. Museums, camps, and even an educational specialist at NASA have used the Dip-er-do to teach concepts of areodynamics and aviation. You can easily and effectively use the stunt plane in your own classroom too. Teacher, Jennifer Landis developed the activities provided here to use this impressive toy for introducing core physical science principles. Simple adjustments to the wing tips and tail flaps let you perform incredible indoor air stunts. Grades 4–12. 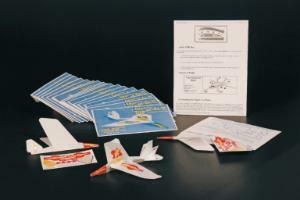 Includes instructions and supplies to build 25 planes.